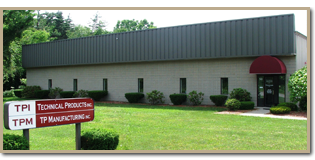 Welcome to Technical Products, Inc.
TPI is a Product Development and Contract Manufacturing company with an extensive experience base and world-class history of accomplishment. We are an innovative and entrepreneurial staff of extremely capable, ambitious 'techies' and senior, highly experienced technical area specialists. With in-house laboratory and light manufacturing facilities, as well as a consortium of high technology subcontractors at our disposal, we provide our clients with a total technical and management support alternative. TPI offers a range of capabilities, unmatched by any other single source. Our complete spectrum of technical and business abilities can fulfill all your needs- from simple product design to total production and management systems analysis and implementation. Our service is an extremely rapid and economical supplement, or alternative, to your in-house effort; and much more effective than multiple outsourced efforts. We have the experience you seek. We have the technologies you need. We have the drive you want. Let us give you the solution you deserve.